Over the past two months I have been working on and launched the world’s most accurate solar rate analyzer. It was featured by the ex-CTO of the White House and received some excellent press. You can play with the Solar Residential Rate Analyzer here. What makes this application novel is that it combines three really tough pieces of assessing solar payback. I combined Green Button Data, PVWatts, and Open EI’s Utility Rate Database into a single application to allow prospective solar customers to type in their address, upload their green button data, size their solar system, and see their new utility bill after solar. Below are the explanations of these three parts. 1) How much energy does your house consume? If you were to receive an estimate from a contractor on your payback the best they could do is ask for your monthly bill and maybe give you an estimate of what you might be shaving off. The problem here is that even the more sophisticated contractors won’t even go that in depth and you will most likely get a generalized estimate of how much you will save. Here in lies Green Button Data. Green Button Data is an international standard that utilities voluntarily participate in allowing customers the ability to access their hourly smart meter data and grant access to that hourly consumption data as far back as 13 months. 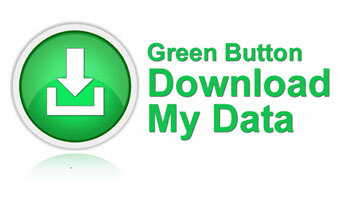 Also instead of downloading the data in a green button file format customers can also use Green Button Connect, an initiative that the three major IOUs in California have adopted already, to a validated third party to access this hourly data in perpetuity (or as long as the customer lives there). Here is a link to the Green Button Initiative and all the utilities currently supporting or pledging to support the standard. 2) How much solar insolation is available at your house? If your home is the desert of Anza Borrego or the fogy mornings of San Francisco Bay the amount of solar insolation or solar resource available will vary. Fortunately the good folks at the National Renewable Energy Lab (NREL) have developed an API to calculate the amount of solar insolation and hourly AC productionof your solar panel given a few parameters including the latitude and longitude (or address), azimuth and tilt of the solar panel, and system size. This makes for an incredibly powerful and convenient method of calculating hourly kwh production. Here is a link to the NREL PVWATTs API. 3) I get it solar chips away at my net consumption. I still have no idea how this translates into my monthly utility bill. Lets start with basics first, the typical default utility rate structure is a tiered rate structure where if you use more than X kwh allotted to you in that month you get bumped into Tier 2 where it cost more per kwh than in Tier 1. So if your house is an energy guzzler with air conditioning and a pool pump and you are in tier 4 getting charged at 32 cents a kwh it would be in your interests to shave off enough of your consumption to get back into Tier 2 where you might be getting charged 18 cents per kwh. The US has a lot of utilities that range from investor owned, to COOPs, to Municipality owned. Each one has their own unique surcharges, unbundled rates, and they update these rates almost every month often unpredictably. The DOE has recently given it stamp of approval to Open Energy Information’s (Open EI) Utility Rates Database API. This is an incredible service available to the public operated and run by Dr. David Loomis at Illinois State University. It allows one to access the the rate structure and tariffs of almost every utility in the U.S through their API. The API is very flexible in that it allows one to digest Time of Use, Tiered, and Tiered Time of Use date in a matrix format that accounts for differences in weekends and weekdays.